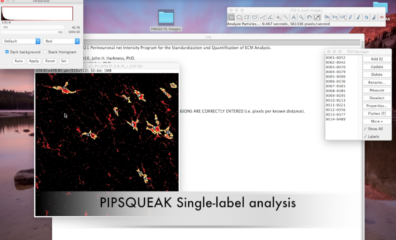 You can download PIPSQUEAK from ImageJ by adding our repository to your FIJI Update Sites. 0.92 CHANGE LOG: Splines Reticulated. Llamas Herded. 0.943 CHANGE LOG: Lots of good things. Big changes. Re-strategized ROI seeding for double-labeling. Added user choice for ROI enlargement. Started saving ROI overlays in directory. Raw images retained for double-label double checking in semiautomated mode. 0.944 CHANGE LOG: Fix bug in saving single-label ROIs. 0.945 CHANGE LOG: Fix for double-labeled PV user check timing. 0.946 CHANGE LOG: Set default WFA ROI enlargement size to “0”. Added merged image load during double-label check steps. >> 1.00 CHANGE LOG: Nothing changed from 0.947. Future versioning strategy will use the tenths place digit to signify significant changes that will affect analysis results (ie 1.03 to 1.10). Data collected using versions of PIPSQUEAK that differ by a tenths place digit should not be directly compared. Data collected using versions of PIPSQUEAK similar by the tenths place digit can be compared or combined in statistical analysis (ie 1.03 and 1.04 or 1.09). 2.01 CHANGE LOG: UI improvements in cell counting function. 2.02 and 2.021 CHANGE LOG: UI improvements in settings window.